To create your own python-based module which allows CRIMSON to communicate with your particular solver, you first need to familiarize yourself with the Concepts that CRIMSON uses for the description of the computational domain and the solver setup entities (such as boundary conditions). Once you have a clear understanding of these concepts, proceed to the next section. 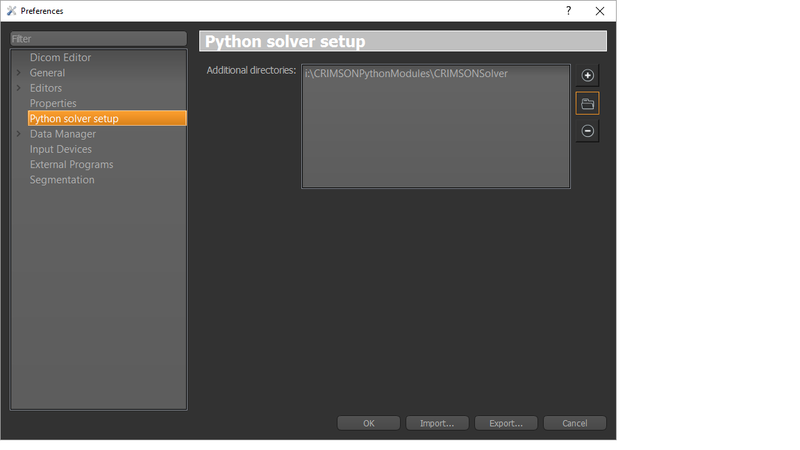 To let CRIMSON know about the location of your module, open CRIMSON, go to the ‘Window’ menu, choose ‘Preferences’, choose ‘Python solver setup’, and add the full path of the directory you created to the ‘Additional directories’ list. Note that this should be done once and it will be saved until a new version of CRIMSON is installed. During development, it is useful to know if anything went wrong during the execution of your python code. To see the output of the built-in python interpreter, you can either look at the CRIMSON console window, or you can open the Python view and the interpreter output will be duplicated in that view. It is recommended to create a very small lightweight scene, so that loading it can be done very quickly. In some cases, calling PythonQt.CRIMSON.Utils.reloadAll() is not enough to ensure that no old code remains in the system. In this case, reloading the scene is a very simple way to make sure of that.